The story of the Bahá’í Faith begins in Ninteenth century Persia – the country we now call Iran – about 160 years ago. Bahá’ís trace the founding of the Faith to the Twin Prophets, the Bab and Bahá’u’lláh. The teachings of the Bab and Bahá’u’lláh were entirely peaceful. They met with unrelenting persecution at the hands of the Shiah Moslem Clergy due to the fact that they proclaimed a new Revelation which abrogated the Law of the Quran and rejected the dogmas of the Iranian Religious leaders. 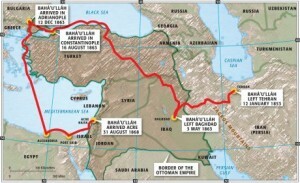 The map at the upper right shows the successive Banishments of Bahá’u’lláh. Many of the main events of Babi and Bahá’í history figure in the history books of 19th Century Persia and several outstanding western historians -drawn to the scene through news reports- traveled to Persia and chronicled the events they witnessed or investigated. Today there are over five million Bahá’ís in over 200 countries. The Shrine of Bahá’u’lláh is located very close to the place of His final banishment in Israel and the Shrine of The Bab is located close by on Mount Carmel in Haifa Israel. The World Center of the Bahá’í Faith is also in Haifa Israel.